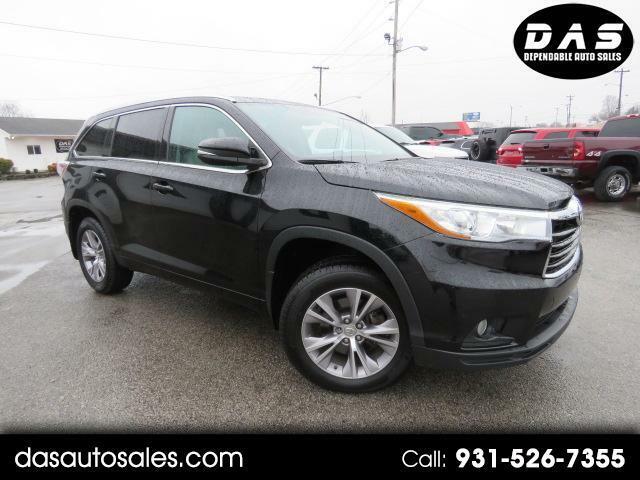 Practically perfect, our 2015 Toyota Highlander XLE AWD in Attitude Black Metallic provides a smooth quiet ride with sharp handling, tons of space and easy maneuverability that sets the stage for a fun adventure. Powered by a strong 3.5 Liter V6 that generates 270hp while coupled with a smooth-shifting 6 Speed Automatic transmission for easy towing or passing requirements. This All Wheel Drive offers near 23mpg on the open road while showing off sporty sophistication with a dramatic grille, integrated fog lamps, roof rails and a fantastic sunroof. The spacious XLE interior comfortably seats 8 and features chrome-plated accents, leather trim, and a widened third row. Front row passengers will love the feel of heated seats and everyone stays comfortable with three-zone automatic climate control. With Entune Premium Audio and Navigation you'll have easy access to fuel prices, sports, traffic, and weather via most smartphones with a data connection. You'll also enjoy a touchscreen display, Bluetooth phone/audio connectivity and available HD/satellite radio. Built with your hectic lifestyle in mind, Highlander boasts clever storage cubbies, multiple cup holders, a massive cargo area behind the third row and the convenience of an adjustable power liftgate. Of course, our Toyota engineers have exemplary safety in mind with multiple airbags, anti-lock brakes, traction and stability control, a backup camera and a tire-pressure monitoring system. Find out what our stellar Highlander can do for you and your passengers! Print this page and call us Now... We Know You Will Enjoy Your Test Drive Towards Ownership!